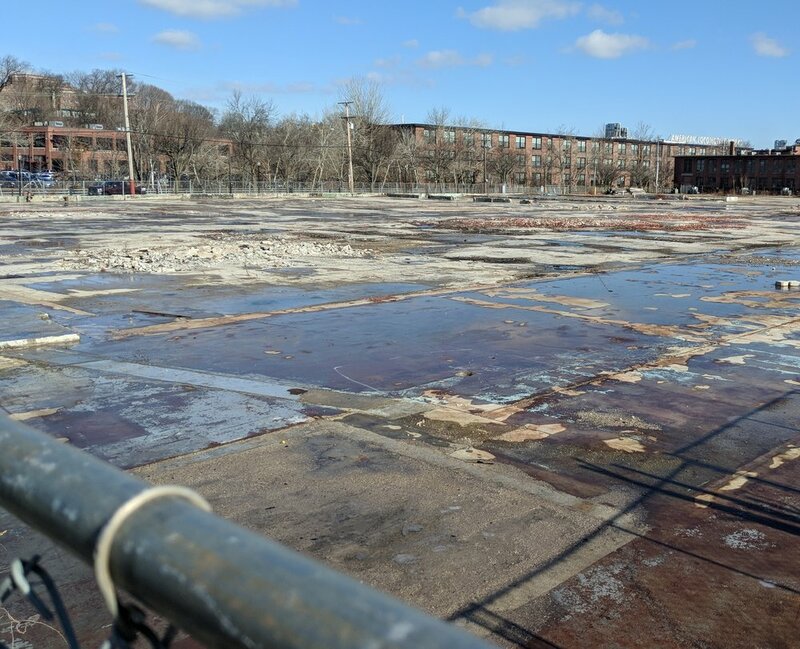 PROVIDENCE — Cleaning polluted land isn’t cheap, but thanks to a federal and state program funds are available to return some of these brownfield sites to commercial and residential use. On Feb. 9, the Rhode Island Department of Environmental Management (DEM) awarded $3.7 million to nine polluted sites for clean up and redevelopment. One of the sites will be home to a new facility for Farm Fresh RI, the nonprofit distributor of local food and farmers market manager headquartered in Pawtucket. The lot at 498 Kinsley Ave., in the Valley neighborhood, is the remnant of a massive mill fire in 2015 that destroyed the building. The 3.3-acre site will now host the Rhode Island Food Hub, a mixed-use facility that will serve as a distribution center for local food and produce. It will offer food production facilities, nutrition education, job training, and retail markets. Farm Fresh will occupy half of a new 60,000-square-foot building. Other food-related businesses will rent the rest. The Food Hub site is across the street from another brownfield success story, The Steel Yard, the industrial arts studio that received $2.1 million in brownfield funds in 2010 to remediate a 3.8-acre site. The Steep Yard hosted the announcement for the program's latest grant recipients. The state portion of the funds were from the state Brownfields Remediation and Economic Development Fund, with money from the 2016 Green Economy bond referendum. DEM and Gov. Gina Raimondo used the event to promote the proposed $48.5 million 2018 Green Economy and Clean Water Bond. Should voters approve the referendum, the money would be spent on parks, bikeways, open space protection, brownfield remediation and climate resiliency. One of the sites receiving funding under the 2016 bond is existing open space: a 3-acre lot once owned by the Department of Transportation. A parcel at Route 403 and Frenchtown Road in East Greenwich received $33,200 for site work on land that will host Cove Homes, a private development for low-income and senior housing. $480,000 to Farm Fresh RI at 498 Kinsley Ave. Project to convert blighted, fire-damaged site into a food and agricultural campus to provide jobs and local food. $429,267 to FXF Hydro/Clark's Mill on Shannon Village Road in Richmond for removal and clean up of contaminated soils of a property that includes access to Shannock River and to prepare the site for rehabbing of existing structures. $396,000 to Meeting Street schools at 928 Eddy St. and 66 and 80 Seymour St. to support the expansion of the school campus with outdoor recreation facilities for children and families. $176,220 to Evolution Mills at 65 Manchester Road in West Warwick to continue ongoing restoration of a large mill complex for office, retail, and artist spaces with residential areas. $122,592 to Collette Travel at 183 Front St. in Pawtucket for rehabilitation and redevelopment of a park, public garden, and 500 feet of bikeway for the Blackstone Valley Bikeway. $52,160 to Pierce Street Properties at 87 and 89 Pierce St. in Westerly for clean up of a vacant lot in a residential area. The project will eliminate potential exposure to pollution and allow for the restoration of the property. $46,960 to Tallman Enterprises at 390-392 Pine St. in Pawtucket for a redevelopment project that includes rehabilitation of the existing buildings to create additional manufacturing, office, retail and residential space. In addition to these projects, DEM is using $442,200 from the Environmental Protection Agency's Targeted Brownfield Assessment program for five additional projects. Also, about $980,000 in loan funds are being set aside for eight projects for RI Infrastructure Bank's Brownfields Remediation Revolving Loan Fund.